Sorry for the grainy iPhone pictures by the way – my camera just won’t work! I got this green cotton with the intention of making a shirtdress with it. I’d seen another in a similar colour somewhere else (I forget where now) and thought it looked pretty. Gradually, I went off that idea and – with having so much of the cotton – I decided to make my first crepe with it! The satin I had from another project with I’d finished a long while before and it was completely accidental that I discovered they were a perfect match! I didn’t make a muslin for this first dress – that was my big mistake with this. The top is way too big and is very baggy on me. The shoulders frequently fall down so I pretty much always have to wear a cardigan with it. The back also gapes: it really is as baggy as it is on the dummy here. Still, I love it and I will wear it a lot (it was the mainstay in my “Dress Up Like Christmas for Lucy’s Last Day Before Maternity Leave” dress (topped with a white cardigan and red earrings, of course!). It’s perfect for work (and is now, sadly, the exact same colour as the uniforms some of the department have to wear) and it has pockets. POCKETS! You really can’t go wrong with a dress that has pockets. Perfect for storing pens, passes and pagers. 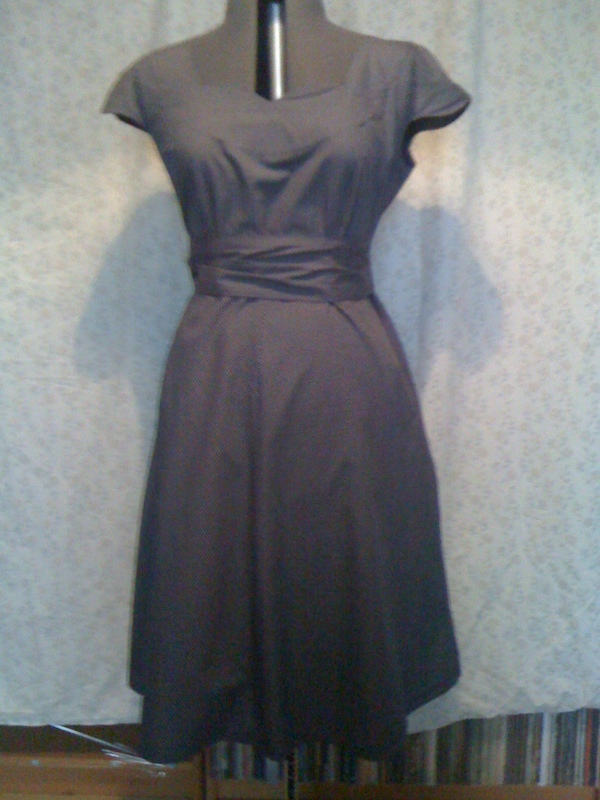 Unfortunately, where the armhole turns back in on itself a little to go under the arms is a weak point on this dress. I don’t mean aesthetically, just practically. When I reached to pull the car door closed one of the first few times I wore it the left hand arm tore as I reached. I believe this has happened to a few other people as well so it is something to keep in mind if you’re making your own version. So, then, her is number two: my Looks More Expensive Than It Was Crepe. This black material looks a lot like sateen (not that you can tell much from the pictures). It’s not. It’s a lycra cotton mix I got when I was in Paris. I got 3 metres of this stuff for €10, and the John Kaldor satin from Leah at Sewbox for around £6. The cotton-lycra mix though? It’s great! The drape of the fabric really suits the shape of the dress and the softer than soft satin tie really makes it something else. For this one I DID make a muslin and it fits perfectly.This may be helped along a little by the very slight stretch in the fabric or by the serious adjustments I did! I retraced the bodice a size smaller then took a good inch out of the back, dropped the neckline by about an inch and a half at the aped and adjusted the bust darts. I also took about an inch from each armhole and dropped the shoulders down at the sleeve end (about 1 inch, I think) tapering them back to the original point at the neck. 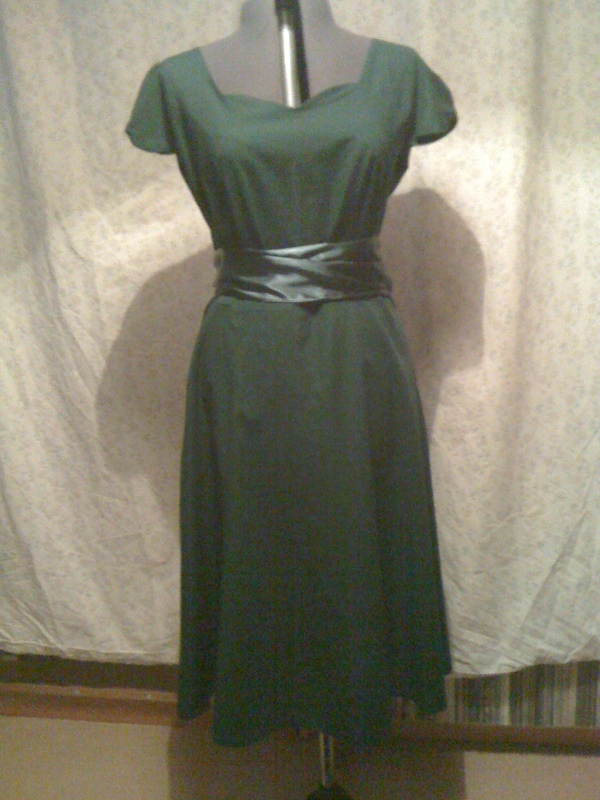 I have one gripe about this version : the facings just never stay down for me (on any of the dresses I made with this pattern)so I catch stitched all the way around the neckline and the sleeves. Because the material has a slight sheen these catch stitches are quite obvious. The back certainly looks – and feels – a hundred times better. The great thing about this dress is that it wraps at the back so no one ever thinks it’s a wrap dress. When I’ve pointed it out people just don’t believe me until I show them the back. Major kudos to Sarai for that one! 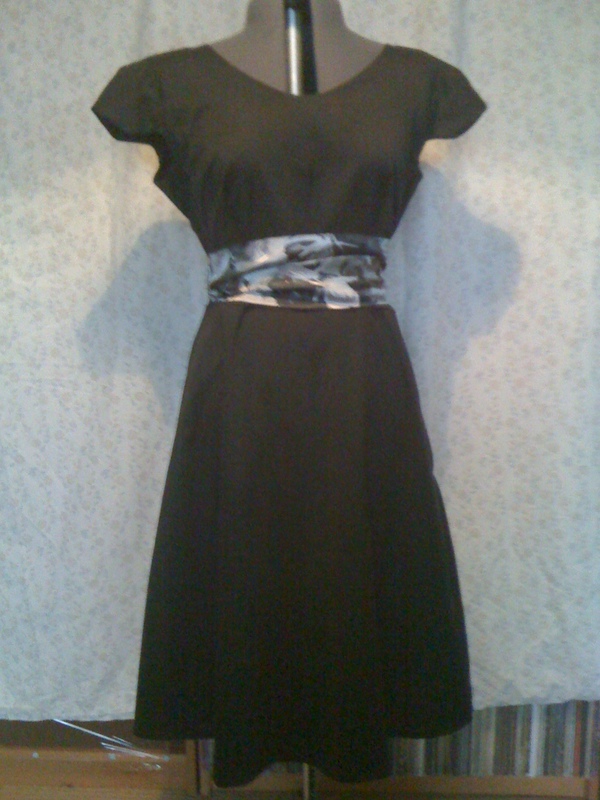 Here’s a close up of the tie for this dress. 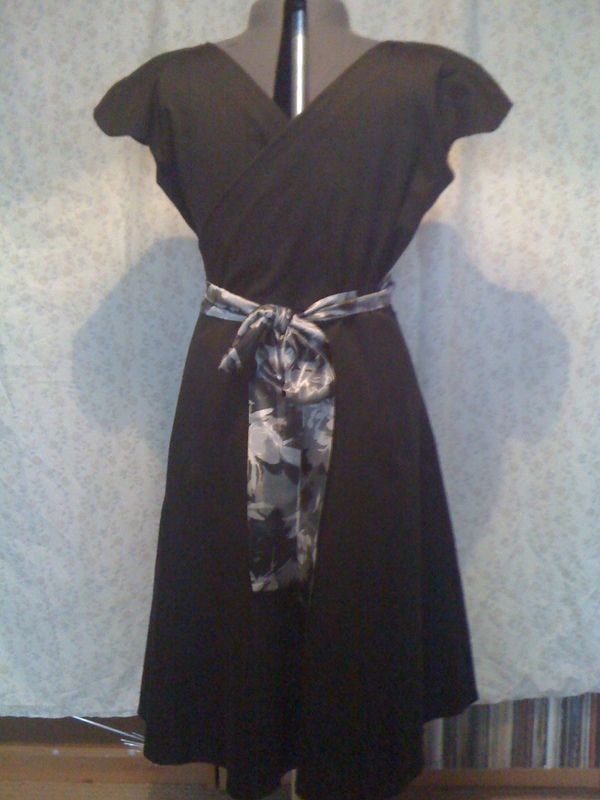 This is a mixture of version 1 and two: version 2 in the neckline, version 1 in the tie. I love it. This is one of my most favourite items to date. In fact, i’ll be wearing it out tonight with some nice shiny red shoes. It was supposed to be my Crepe Sewalong Dress but I got too impatient and just finished it because I really really wanted to wear it. I know that’s a rubbish excise, I really do. I promise I’ll do it right next time Gertie! 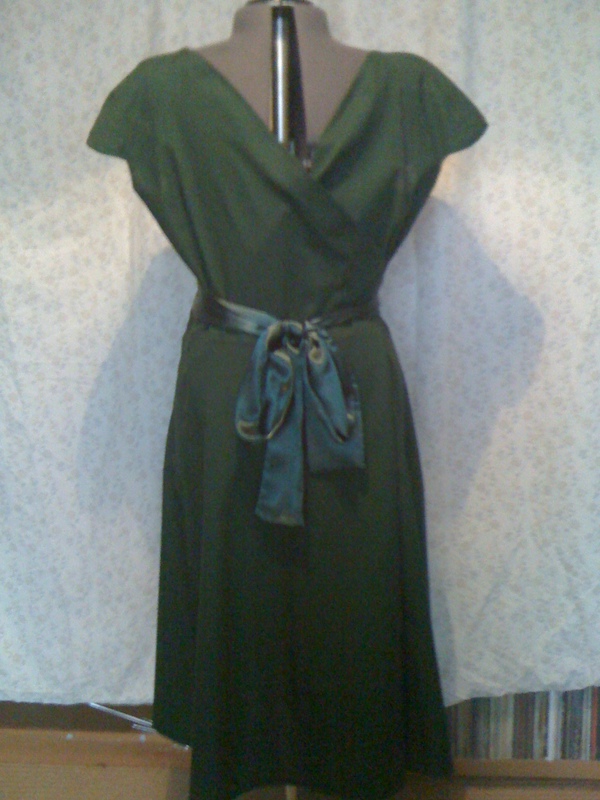 Again, with this one I use the second muslin I made: the same as I used for version 2. And this time I remembered I had an overlocker so it looks as pretty on the inside as it does on the outside. As with version two though, I did a catch stitch around the armhole facings and neckline facings (and all down the back this time too). It’s more obvious on this dress for some reason so I’m going to take it all back out and just catch stitch in less obvious places. Okay, so I hope you like all these versions and I hope that whoever is doing the sewalong has more patience that me! Leave a link here if you’re doing the sewalong and show off what you’re doing! I really like those. The colours are great and I love the contrast of the satin against the body fabric. Thanks Catherine! 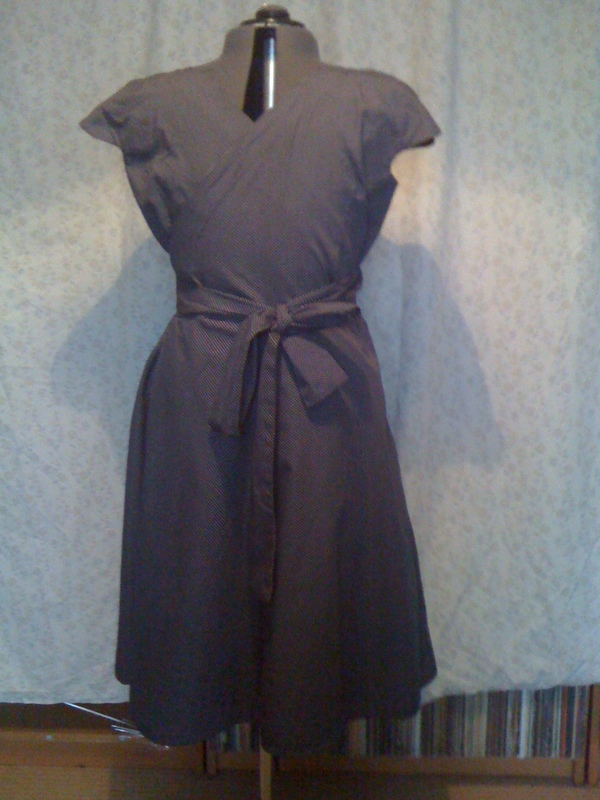 I find myself wanting to make more and more of this dress: I@m going to have to stop myself at some stage!